All service classes must inherit from the base service class \TYPO3\CMS\Core\Service\AbstractService, unless the service type provides a specific base class (authentication services, for example, inherit from \TYPO3\CMS\Core\Authentication\AbstractAuthenticationService instead). These specific classes should normally themselves extend \TYPO3\CMS\Core\Service\AbstractService. This class provides a large number of important or useful methods which are described below, grouped by type of usage. These methods are related to the general functioning of services. init() and reset() are the most important methods to implement when developing your own services. This method is expected to perform any necessary initialization for the service. Its return value is critical. It should return false if the service is not available for whatever reason. Otherwise it should return true. Note that's it's not necessary to check for OS compatibility, as this will already have been done by \TYPO3\CMS\Core\Utility\ExtensionManagementUtility::addService() when the service is registered. Executables should be checked, though, if any. The init() method is automatically called by \TYPO3\CMS\Core\Utility\GeneralUtility::makeInstanceService() when requesting a service. When a service is requested by a call to \TYPO3\CMS\Core\Utility\GeneralUtility::makeInstanceService(), the generated instance of the service class is kept in a registry ($GLOBALS['T3_VAR']['makeInstanceService']). When the same service is requested again during the same code run, a new instance is not created. Instead the stored instance is returned. At that point the reset() method is called. This method can be used to clean up data that may have been set during the previous use of that instance. Clean up method. The base implementation calls on unlinkTempFiles() to delete all temporary files. 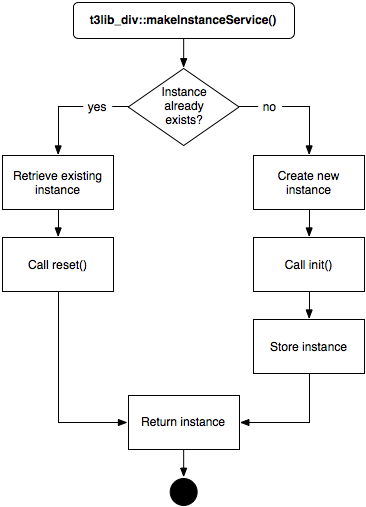 The little schema below summarizes the process of getting a service instance and when each of init() and reset() are called. Most of the below methods are quite obvious, except for getServiceOption(). This method is used to retrieve the value of a service option, as defined in the $GLOBALS['TYPO3_CONF_VARS']['SVCONF'] array. It will take into account possible default values as described in the Service configuration chapter. the third parameter can be used to temporarily switch off the usage of the default configuration. This allows for a lot of flexibility. This set of methods handles the error reporting and manages the error queue. The error queue works as a stack. New errors are added on top of the previous ones. When an error is read from the queue it is the last one in that is taken (last in, first out). An error is actually a short array comprised of an error number and an error message. The error queue exists only at run-time. It is not stored into session or any other form of persistence. Puts a new error on top of the queue stack. Removes the latest (topmost) error in the queue stack. Returns the error number from the latest error in the queue, or true if queue is empty. Same as above, but returns the error message. Returns an array with the error messages of all errors in the queue. Returns the latest error as an array (number and message). This method checks the availability of one or more executables on the server. A comma-separated list of executable names is provided as a parameter. The method returns true if all executables are available. The method relies on \TYPO3\CMS\Core\Utility\CommandUtility::checkCommand() to find the executables, so it will search through the paths defined/allowed by the TYPO3 CMS configuration. Internal method to temporarily deactivate a service at run-time, if it suddenly fails for some reason. A lot of early services were designed to handle files, like those used by the DAM. Hence the base service class provides a number of methods to simplify the service developer's life when it comes to read and write files. In particular it provides an easy way of creating and cleaning up temporary files. Checks if a file exists and is readable within the paths allowed by the TYPO3 CMS configuration. Reads the content of a file and returns it as a string. Calls on checkInputFile() first. Writes a string to a file, if writable and within allowed paths. If no file name is provided, the data is written to a temporary file, as created by tempFile() below. The file path is returned. Creates a temporary file and keeps its name in an internal registry of temp files. Adds a given file name to the registry of temporary files. Deletes all the registered temporary files. These methods provide a standard way of defining or getting the content that needs to be processed – if this is the kind of operation that the service provides – and the processed output after that. Sets the content (and optionally the type of content) to be processed. Sets the input file from which to get the content (and optionally the type). Gets the input to process. If the content is currently empty, tries to read it from the input file. Gets the name of the input file, after putting it through checkInputFile() . If no file is defined, but some content is, the method writes the content to a temporary file and returns the path to that file. Gets the output content. If an output file name is defined, the content is gotten from that file. Gets the name of the output file. If such file is not defined, a temporary file is created with the output content and that file's path is returned.